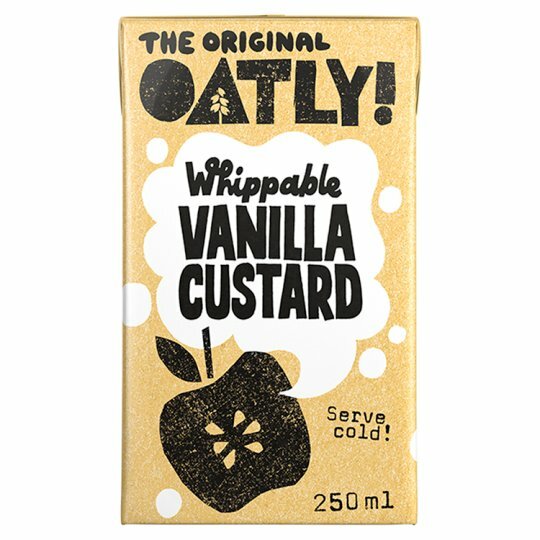 Oat based vanilla flavoured alternative to custard. As a kid, this was the type of product that you wanted to find in the kitchen when no one else was around so you could drink it. It tastes that good. Now that you are grown up, you know such behaviour isn't very adult but you should also know that we tried to make this so good that if you put a little on your finger, you would be tempted to revert back to those days when you were a kid and no one was in the kitchen to see you tip the jug and take a gulp. Of course there is one big difference. This is made of oats, which means it is made on something that grows beautiful in the ground. Now over to the technical features section: you can whip it up to make it fluffy or just pour straight onto some berries from your garden or that apple pie you were thinking about making. You can use this as it is or you can whip it to smithereens and watch it fluff up to double size. It's completely vegan and contains 0% trans fat and only 3% saturated fat. Right now you could be thinking two things. Either you think this sounds great and you can't wait to try it, or you think that all that fat talk is not enough to convince you and if that is the case, drop your smartphone, turn off your computer, jump on your segway and get to the store to give it a try. You may be pleasantly surprised. Whip it up to make it fluffy or just pour straight onto some berries or a homemade pie.